I think that would work too. Whenever a find does not fit to the set typology, name a new type after the location (if known) of this first find. The problem arises when, as in the example above, it is from a private collection and there is no known provenance. Does it then become a 'Guttmann Italic Aquincum type 1'?? Wish I had seen this thread sooner. 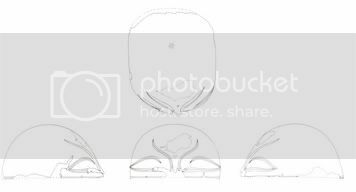 Using a typologically-based, descending hierarchical classification for helmets would sort typologically similar helmets closer together. This works well with Windows Explorer, where I can more quickly compare & contrast within & between clusters of helmet types. Grouping by find location or collector's name would slow such analyses. 2. Year it was found or published first. So we would get Aquincum 2002, eg. If there were two, the one earlier published or found would be Aquincum 2002 I, the one later published or found Aquincum 2002 II. We do not have that many helmets, so this system should work very well. Second, it is much easier for me to connect the 'image' of a type to a name than to an A, D, F or G.
The HRR classification should be added, but I would prefer a 'Weisenau - Mainz 19xx' or 'Montefortino - Cremona 19xx', too. Quote: Wish I had seen this thread sooner. Grouping by find location or collector's name would slow such analyses. Any given typology can only be as good as the criteria used to establish it. I donâ€™t think that we can fault Robinson for his on the grounds that it is â€˜datedâ€™. The fact that he put it together more than 30 years ago is irrelevant; the only thing that matters is whether or not it is effective. It remains the case that Robinsonâ€™s helmet typology is the only one that covers the complete course of Roman military helmet construction (with the exception of the later 4th century types, of course). That due to M. Kohlert, for example, only deals with the cavalry sports helmets, while those of Maurino and Lenerez de Wilde and others are concerned solely with the Montefortino types. Classifications will always be a bother, mostly because the data can be confusing at times - some helmets lack cheek plates or some part that could/would have set it apart from the 'main' type. The other snag is our modern wish for standardisation, something may well have been unheard of in the old days. I share the confusion about find spots though - what's a 'Heddernheim' when several helmets were found there? OK Mike, some valid points. The HRR system with added find location perhaps? Seriously, don't blame poor old Robinson for my failings. :oops: If you have a look, you will see that I have altered the entries for these two helms. I agree, the one I had originally called a Gallic C is an Italic C - for one thing the dratted thing is made of bronze (OK, "copper alloy"). I think I was paying too much attention to the form of the helmet and not enough to what it was made of. It doesn't have the 'eyebrows' and this would (should) immediately have pointed me at the Italic range, rather than the Gallic. The other Guttmann helmet is much more of a problem. It appears to be a unique type, but I do think that it's nearer to a Gallic C than anything else and I've made a comment in the 'remarks' section to this difficulty. If anyone can come up with a better argument - with reasons - where it should go, then I'm certainly open to suggestions. I'm not saying that Robinson''s classification is perfect (the comment I made above proves this). However, it should certainly serve as a basis for a system. As more information becomes available, any taxonomy can be expanded to accomodate the new data. Maybe this 'Gallic C' is a new type and should be recognised as such? Hi Mike, I don't blame anyone! Just having a discussion. The Guttman Italic still poses some problems, as it seems to be somewhat of halfway-house between Gallic I and Italic something else. I'm afraid I still can't see the similarity between this and the Cremona Italic C helmets. (Other than it being made of cupric alloy). This is particularly evident in the cheek guards and the crest support type. 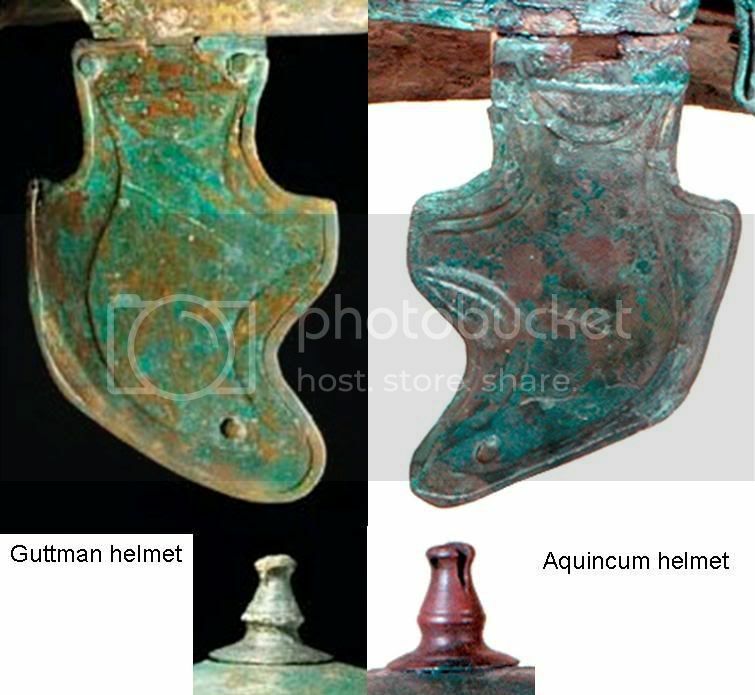 They are almost the same as the Aquincum helmet. The cheek guards of most early Italic helmets are crude to say the least. These have nicely bound edges which the earlier C types don't have. Nor do they have the decorative brow band strip or a carrying handle. It also has riveted-on ear guard flanges, unlike the Italic C's which are integral to the bowl, just flared. This helmet is a perfect example of a find which doesn't neatly slot into one of Robinson's pigeon holes. This is where his 'development' system falls down. Quote: Maybe this 'Gallic C' is a new type and should be recognised as such? Possibly, but are you forgetting the helmet found at Kessel/Lith in the Netherlands? It too has similar eyes. It's kind of a hybrid of a Port Bei Nidau type B and a Gallic A. Neither of these helmets have a brow guard like the later Gallic C from the Kupa river. Quote: Another potential hurdle is that the â€˜site nameâ€™ system can get unbelievably cumbersome. If there is a problem with deciding precisely which â€˜Robinsonâ€™ type you have, you can always hedge the bet by saying something like â€˜Imperial Gallic H/Iâ€™. This is much easier to do than stringing apparently endless place names together. You only have to look at the late pattern helmets to see what a mess using â€˜find spotsâ€™ can get us into. This I would count as the main argument against the names-method. However, I do not really agree. NiedermÃ¶rmter Guttmann 2002 would be quite clear. In general, a classification based on stylistic devices seems to me inadequate: Too unclear, too subjective. What happens if you don't know where or when it was found? It could happen. Where's that one supposed to be now Adrian? I'm not certain Jasper. The helmet was found during extraction of gravel and sand as part of dredging operations in the area. It was discovered by workmen cleaning the suction pipe and filters of their machinery about 40 years ago. There were a great deal of finds, but I suspect that quite a few ended up being bought from the workmen for private collections. If any of your countrymen have contact with Nico Roymans, he may be able to supply more information?